January 13, 2014. Posted in Kerala. 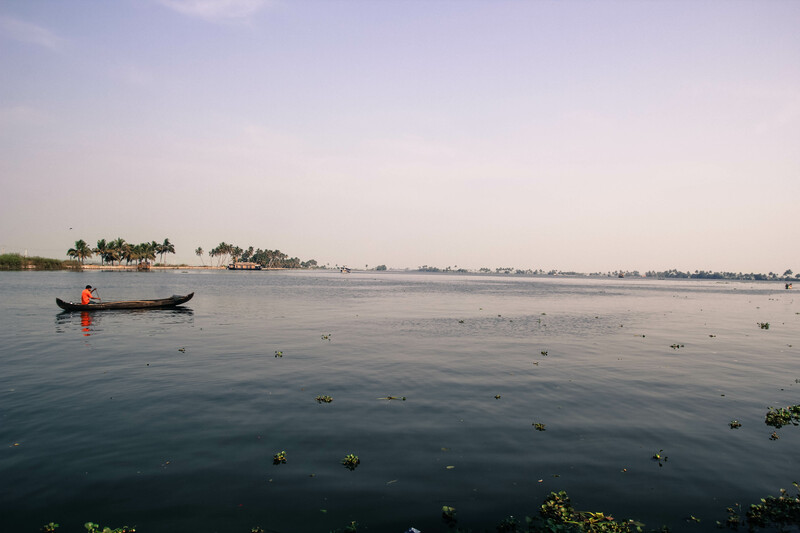 The sleepy backwaters of Kerala provide a tranquil escape to a simpler world. On quiet waterways under sunny skies, fishermen let their lines hang from small wooden canoes and birds swoop down occasionally to see what fish might be swimming close to the surface. Towering coconut palms line the water banks and rice paddies stretch as far as the eye can see. A kettuvallam, or traditional houseboat, floats down Vembanad Lake in Kerala’s backwaters. 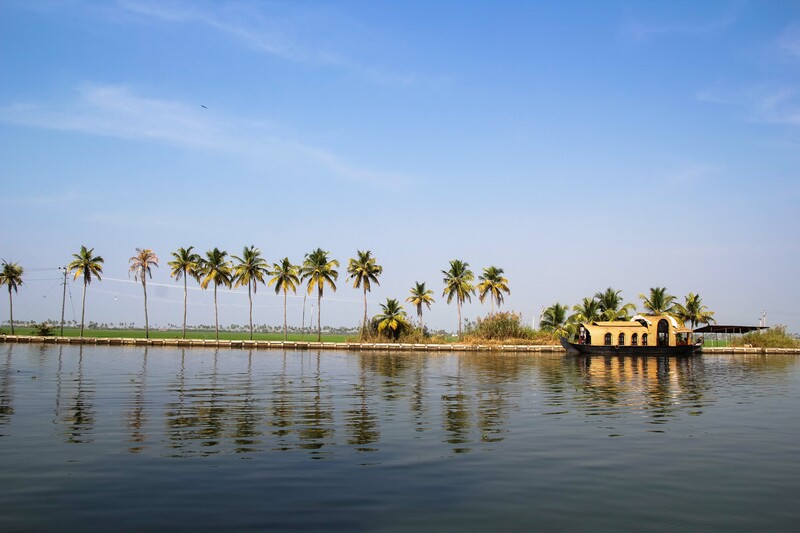 Drawn by this idyllic setting, tourists come from around the globe to float down the backwaters in kettuvallam, traditional houseboats with thatched roofs covering wooden hulls. With tourism comes an infusion of money into a part of the world where most residents practice small-scale fishing and agriculture. It would not be India if there were not eager entrepreneurs setting up businesses to get a piece of the action. 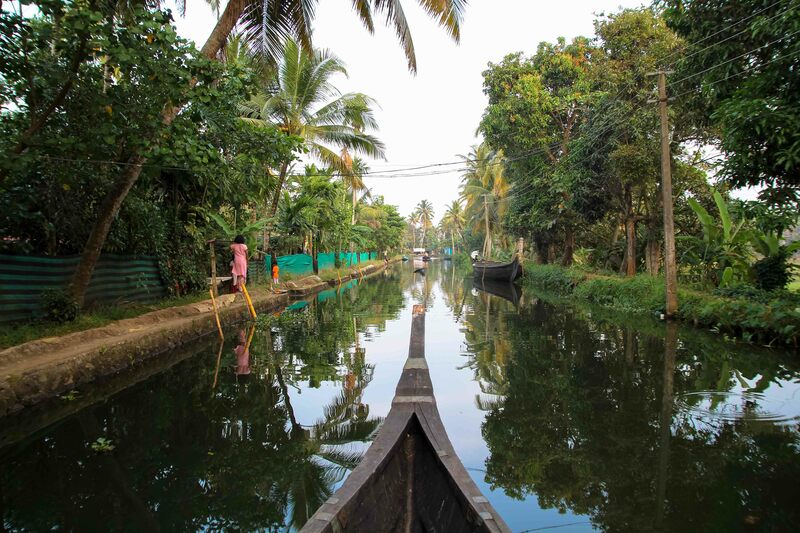 To get a glimpse of life in the backwaters, tourists hire small canoes to take them “rounding” – exploring narrow canals that snake off the main waterways. They glide past women in hiked-up saris beating their laundry against stones in the water and wave to children running home along the banks after being dropped off from school by a motorboat. It is a relaxing ride, but tourists must remain alert, ducking their heads under low-lying pedestrian bridges and swerving from side to side to avoid getting smacked in the face by jutting palm fronds and drooping vines. 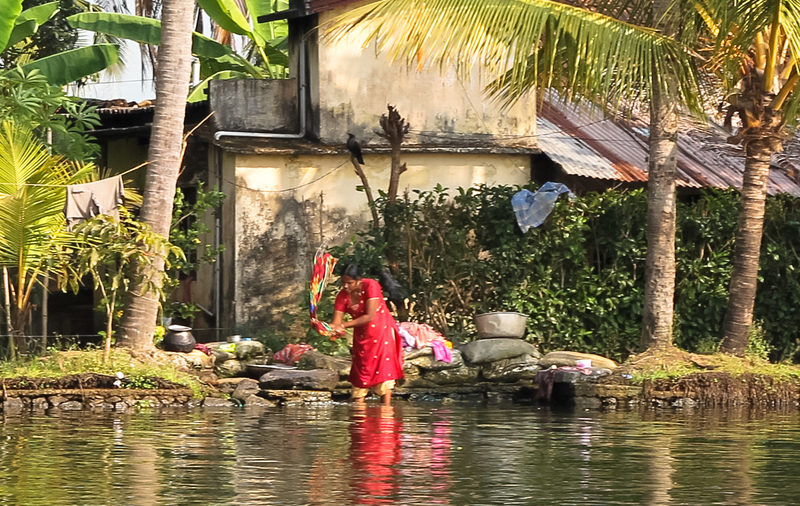 A woman does her laundry in Kerala’s backwaters. 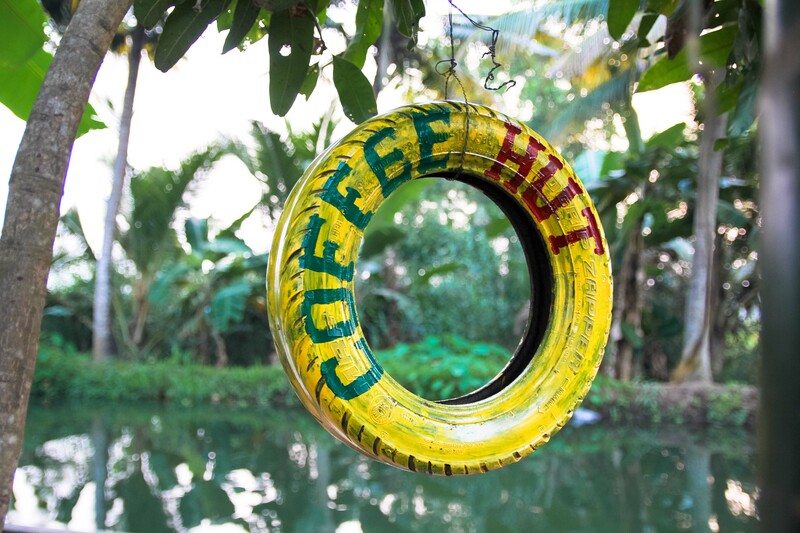 Amid the thick foliage in the backwater village of Kainakary hangs a tire brightly painted with the words “Coffee Hut.” A sign next to the tire promises visitors “spicy tea” and “homely lunch.” This is the work of Preejith Lal, a 22-year-old Keralite who proves the Indian entrepreneurial spirit is alive and well even in the remote backwaters. Two years ago Preejith started selling tender coconuts, surplus from his home supply, to tourists floating by the three-room house he shares with his parents. “We had this nice space under a mango tree with a good view of the rice paddy so I set up a table and some chairs and started selling tea.” Preejith’s friend Akhil snagged a spare tire from the auto shop where he works as a mechanic and painted the Coffee Hut sign. Preejith Lal’s Coffee Hut serves tourists in Kainakary, a village in Kerala’s backwaters. Despite the name, Preejith said most customers order tea. “Kerala is famous for its tea from Munnar,” he said, referring to the hill station some 140 km inland where tea estates cover the terrain. The menu includes a range of flavored teas including masala, chocolate, coconut and vanilla – Coffee Hut’s bestseller. 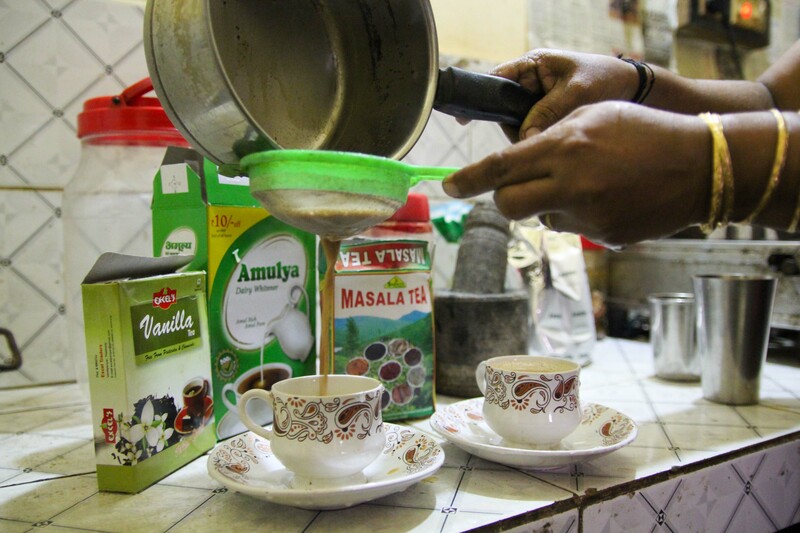 Preejith’s mother Saima pours a cup of vanilla tea, Coffee Hut’s bestseller. Before he started Coffee Hut, Preejith’s family depended on agriculture. His father Prasannan worked as a toddy tapper, climbing coconut palms and collecting their sap, which quickly ferments into a sour alcoholic beverage known as toddy. Since he was 18, Prasannan would work for six weeks straight on a palm plantation in Palakkad, about 200 km north, then enjoy a week’s rest with his family. When Prasannan’s brother died a few years ago, he moved back to Kainakary to manage the family’s five acres of rice paddy. Preejith Lal watches his mother Saima make a pot of tea at Coffee Hut in Kainakary, Kerala. Preejith, who completed a course in marine engineering in the western state of Gujarat, has ambitions beyond the backwaters. “I am hoping to work at sea and I gave my application to many shipping companies, but we need to give two or three lakhs to get admission onto a ship [about $3,200 to $4,800],” he said, alluding to the fees agents demand for job placement services. In the meantime, Preejith contemplates Coffee Hut’s expansion. He is considering building a small house next to his family’s where guests could stay overnight. “It would be a new concept for this area. There are many tourists on houseboats, but no homestays.” But he would be sure to do it in an eco-friendly way. “I don’t want to disturb the habitat and the natural beauty of this place,” he said, pointing to the surrounding bamboo groves. 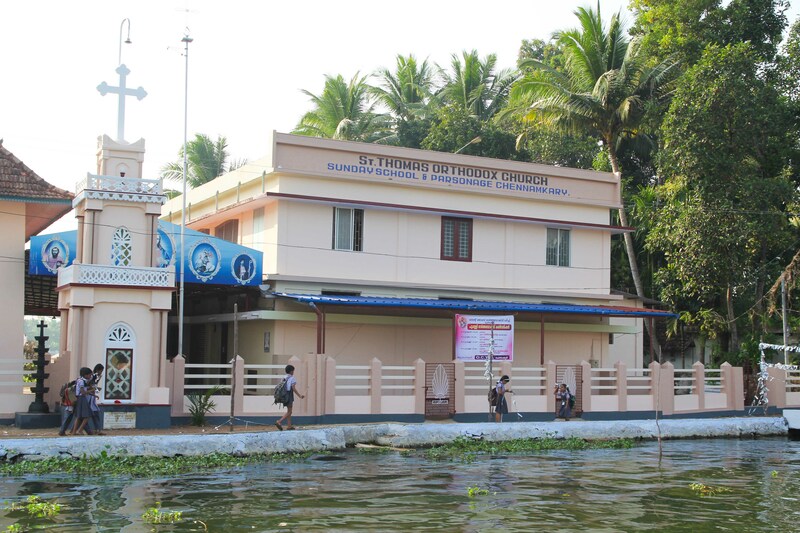 Indeed, while tourism has brought money into the backwaters, it has not come without negative consequences. “Pollution is getting more here. Many of these houseboats are not obeying the rules. Their oil is contaminating the water and they throw all their food waste in the water, which is very bad for the environment,” Preejith said, shaking his head. 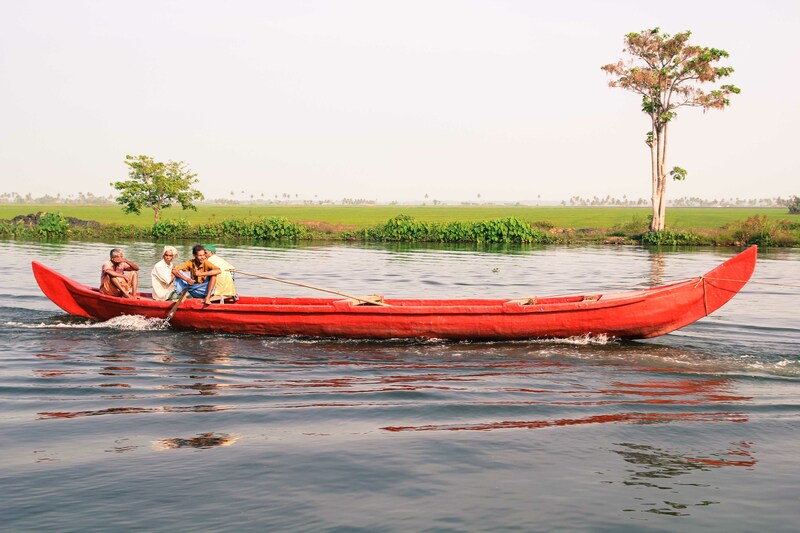 Fishermen float down a waterway near Alleppey, Kerala. 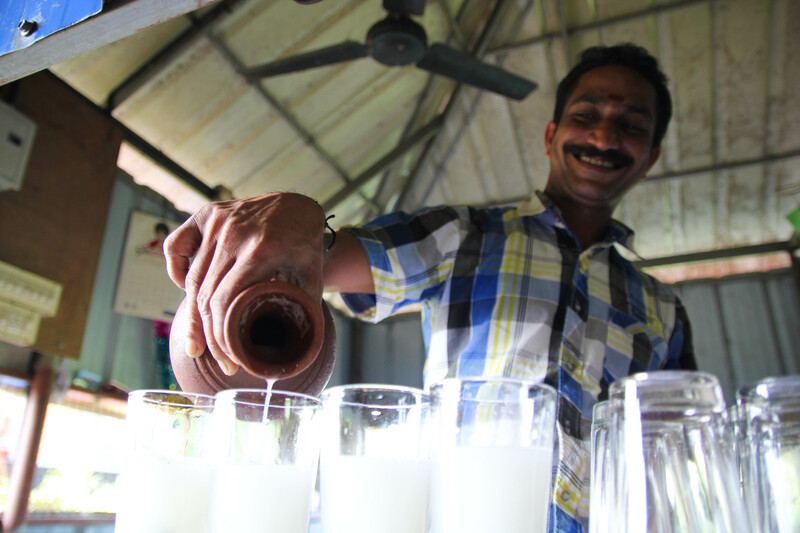 Dev Anant pours a round of toddy, coconut palm wine, in his bar in Kerala’s backwaters. 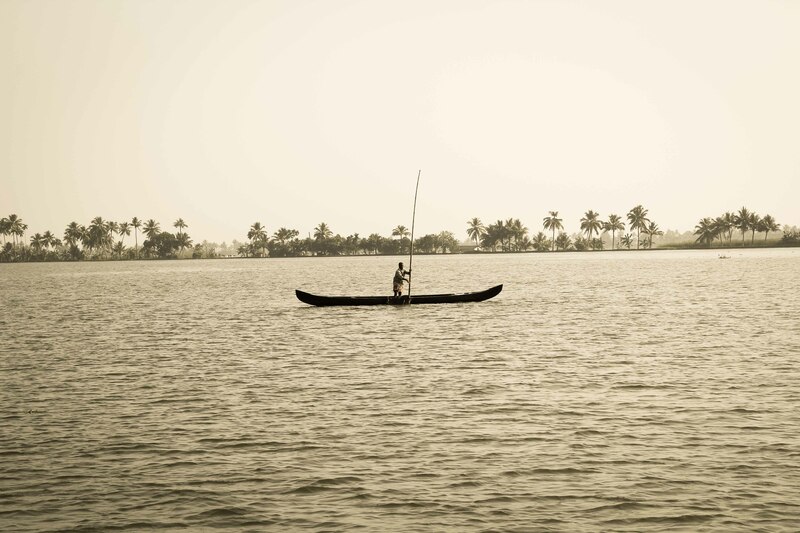 A fisherman heads out to Vembanad Lake, Kerala. 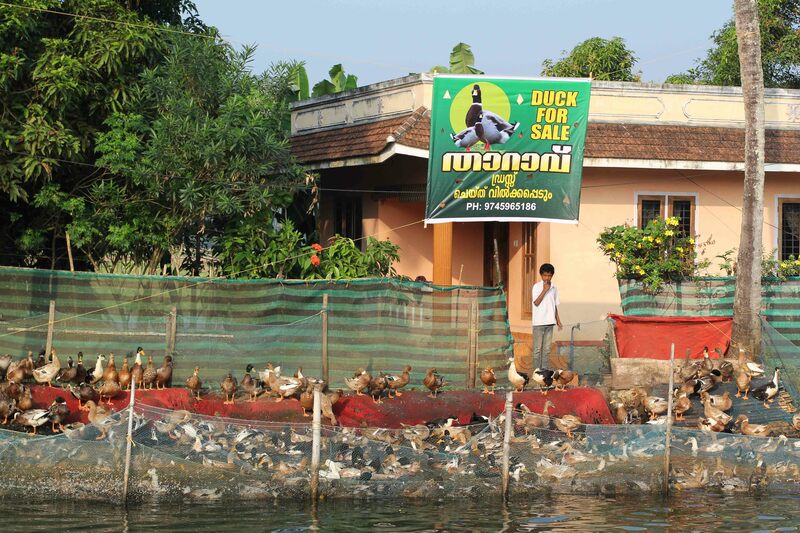 Ducks for sale in Kerala’s backwaters. Children head home from school in Chennamkary, Kerala. A canal in Kainakary, a village in Kerala’s backwaters. 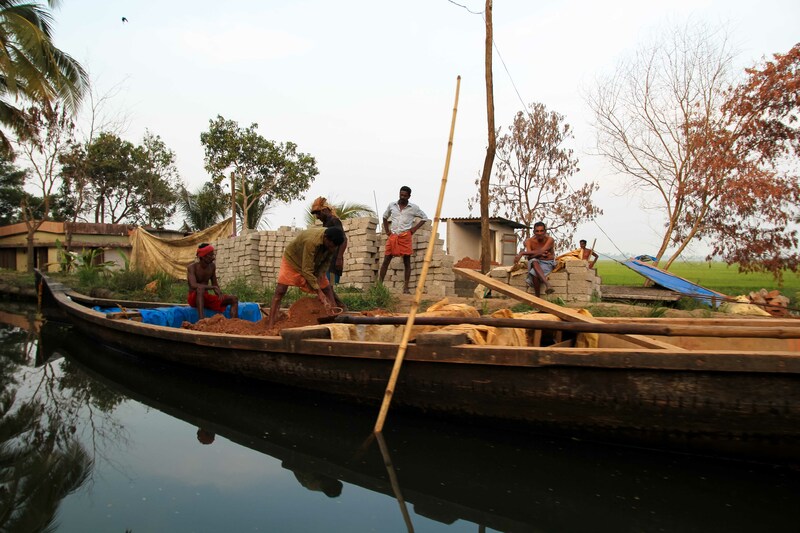 Laborers at work building a house in Kerala’s backwaters. A fisherman tries his luck in Vembanad Lake, Kerala. Tags: Alleppey, backwaters, Coffee Hut, entrepreneur, houseboat, Kerala, Preejith Lal, South India, tourism.